Although the equines bred by the wood elves are much faster and far more agile than regular horses, they tend to be more fickle and harder to master. It takes many years to train an Elven pony, but once tamed, they are among the most loyal and devoted mounts. These unique horses allow Elvish horsemen to ride at extreme speeds through thick forests with nary a scratch and outpace most other cavalry on open ground. Though these riders possess some skill in wielding swords and bows, their greatest effectiveness comes from their ability to scout and outmaneuver enemy forces rather than engage in combat directly. 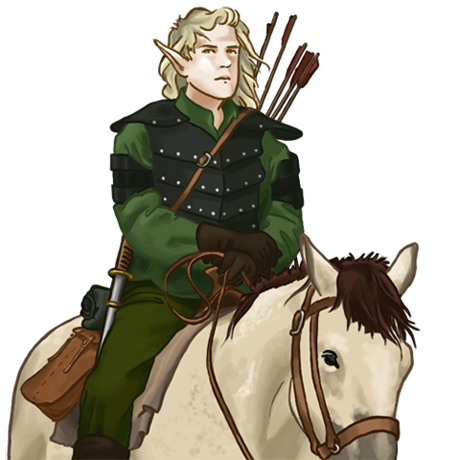 Elvish scouts are most often used as messengers and support units and are adept at quickly transferring information between patrols and skirmish groups, whom they also reinforce when necessary.